Description: CSXT 8569 & 8125 are seen on a rack train at Green Spring, WV. Description: CSX 8569 is on the point of Q-404 at Ridgefield Park, NJ 2/2004. 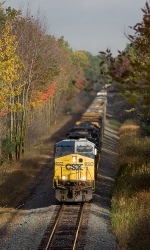 Title: Rack train headed for Claycomo, Missouri. Description: A southbound grain train approaches the diamond for the ex EL at Marion running on the ex C&O. Both lines are now CSX, but the EL line is actually part of the ex NYC, which had joint track through here with EL as part of its Big Four route to Indianapolis. Note the cut outs on the pilot of 8866; they have been modified to run in the third rail territory on Metro North south of Croton Harmon on trains to Oak Point Yard in the Bronx. Description: Hollow Road, 0918 hours. Description: CSX D732 with 8569 leading is westbound on number 1 track at Rosedale, MD.